Back in stock and ready to ship on 8-14-17! B. lateralis are typically found in tropical areas, Asia, Africa, and even the U.S now that they have been introduced inadvertantly. This species ranges in size from 22-28mm and is one of the smallest non-climbers I've found. This species makes up for its lack of size with speed. This is also a very prolific species in captivity. 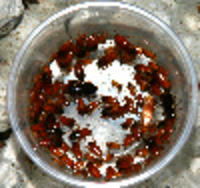 These roaches usually reach adulthood in 3-5 months and then will live another 6-12 months. Blatta Lateralis, also known as Turkistan Roaches, Red Racers and Rusty Reds, are originally from Turkistan, Afghanistan and the Middles East. Blatta are a small fast moving roach. They cannot climb glass or plastic walls, but we recommend Bug Boundary if you are going to keep them in a container without a lid because once walls become a little dirty the little guys can find a footing. Babies can climb if the walls have even a small amount of substrate or scratches. In that case, Bug Boundary Paint or Grease will work well to keep them safe and in their containers. The adult males have wings and females do not have wings. They are approximately 1/16th? when hatched to 1? as adults. The perfect replacement for live crickets. The live approximately 6 to 12 months. We use egg crates, which we stand on end to create climbing structure and places for them to hide. . Use coconut fiber as a substrate. They need some humidity so keep the substrate slightly moist. Temp should be between 75-95 degree and humidity should be approximately 50%. A slightly moist substrate should keep the humidity in that range. Blatta lateralis will eat most roach chow formulas and will also love small amounts of fresh fruits and vegetables. Remove uneaten food within 24 hours so that it does not spoil and attract flies and gnats. Keep Blatta Lateralis on water crystals at all times. Our Cricket Crystals work very well for this purpose. Keep dry roach food and water crystals available at all times. Females can lay 1-2 egg cases per month, and each egg case can contain 20-30 roaches. The cases are susceptible to drying out which is why the slightly moist substrate is important. Once laid, the egg cases will hatch in 2-6 weeks depending upon variability of temperature and humidity. These are super fast breeders and great little roaches. These are the size of crickets, but the do not climb or burrow. A great addition to your reptile diet. These will be small size babies shipping in a cup with a vented lid with egg crate and some food for the trip. All orders placed now, will ship on 8-14-17. We are just allowing the nymphs to be ready to ship. We will send tracking and confirmation when they ship. *Sorry, but we are not permitted to ship to Florida. Thank you. 25 - $16.90 Free Shipping! 50 - $20.80 Free shipping!